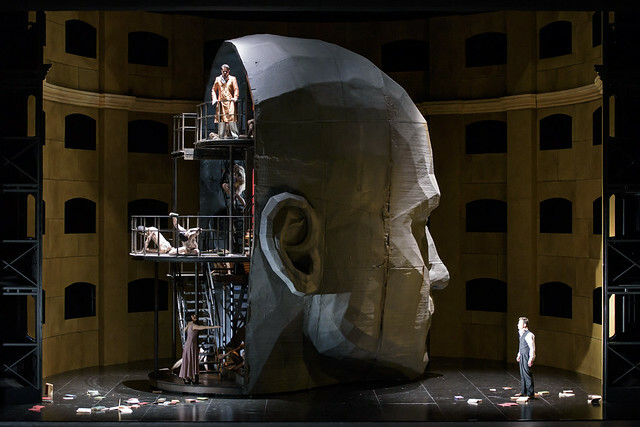 Kasper Holten’s acclaimed new production of Karol Szymanowski's Król Roger was live-streamed on 16 May 2015 via the Opera Platform and the Royal Opera House YouTube channel. The production opened on 1 May, marking the first time the work has been seen at Covent Garden. Read audience reactions to the opening night. The relay, which featured a series of backstage films, including rehearsal footage and interviews with members of the cast and creative team, will soon be available to watch on demand. Find out more about Szymanowski and what themes inspired his composition. The opera follows the story of the devout King Roger, a man weighed down by responsibilities and duty. The arrival of a Shepherd preaching a hedonistic creed threatens to cause chaos for both Roger and his Kingdom. ‘To me, [The Shepherd] is a desire. He is everything King Roger is not, and he can seduce him with his strength and his beauty,’ says Mariusz Kwiecień, who sings the role of King Roger. Director Kasper Holten and designer Steffen Aarfing's production of Król Roger is designed to depict the tension between Roger’s authority as a leader and his self-doubt as a man. An enormous monotlithic statue of a giant head, measuring eight metres tall, dominates the stage. ‘It’s almost too literal’, says Kasper. ‘It shows how, in the first Act, [Roger] lives only in his head, with his mind trying to control everything. On another level, it’s a god-like image in the church, and like a statue of a despotic leader’. ‘Simply because of the size, it becomes a relic or totalitarian image’, agrees Steffen. Read more about the staging of Król Roger. Król Roger runs to 19 May 2015. Tickets are still available.